What should you do if you find a petrel ? Created in 1994 and placed under the coordination of the Réunion’s Directorate for Environment, Development and Housing, the Indian Ocean Nature Brigade (BNOI) is a team of environmental inspectors working all over the island. Unique in France, this brigade is multi-institutional. The agents belong to the National agency for Hunting and Wildlife (ONCFS), the French Agency for Biodiversity (AFB) and Réunion National Park. The study of some specific species either endangered, endemic of invasive. Even though the BNOI’s main activity is environmental police, to which it dedicates 60% of its time, it doesn’t neglect the technical studies led on endangered species. Thus, for more than 15 years, the BNOI/ONCFS contribute to the preservation of Réunion’s endemic petrels. In 2001, its agents, along with Cilaos’ gendarmes, discovered a second breeding colony of Barau’s petrels. Its expertise is today an undeniable asset for the project LIFE+ Pétrels, both technically and decision wise. Its agents participates to exploration missions and both the Mascarene and Barau’s petrels colonies monitoring. Their knowledge of the field and of the species as well as their particular skillset in ropes, mooring, splicing and securing is utterly valuable since they allow the LIFE+ Pétrels team to work on perilous terrains in safe conditions. Moreover, their environmental police competences are appreciated in case an offence is noted. Last but not least, the BNOI is an active stakeholder of the National Plan of Actions (PNA) concerning the Mascarene Petrel as well as the LIFE+ Pétrels project. They help define strategic decisions and the global approach of the project. The LIFE+ Pétrels program is funded by the European Union on a period ranging from 2014 to 2020. It is exclusively dedicated to the preservation of 2 endemic species of petrels. You have been involved in this thematics for 15 years now. What has this program changed regarding the management or the involvement of the ONCFS/BNOI? L’ONCFS/BNOI has always participated in petrel conservation actions. We always were largely involved in them. But, before the LIFE+ Pétrels, it was us who, along with the SEOR and the Réunion University, were in charge of the logistical organisation and who implemented all the field actions (land-based and aerial). The LIFE relieve the BNOI team by taking over the organisation and management of the missions, which is time consuming. It allows us to concentrate only on the technical aspects. What was for dearest memory on the field with the LIFE? I had the chance to be part of the missions that discovered the first breeding burrows of both the Barau’s petrel and the Mascarene petrel. The Barau’s petrel were found by accident. In 2001, 2 gendarmes were searching for an old trail to climb the Piton des Neiges when they stumbled upon an area filled with bird carcasses. Not knowing which bird it was, they contacted the BNOI. 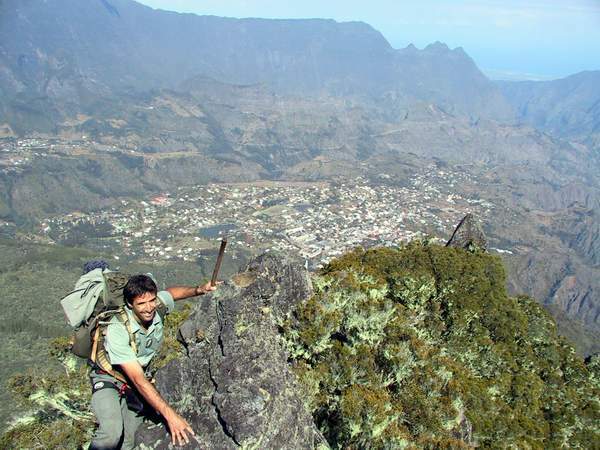 Rapidly after that was assembled a team made of members of the ONCFS/BNOI, the ONF, the SEOR as well as members of the mission dedicated to the creation of Réunion’s National Park. They went on a reconnaissance mission and confirmed the presence of a breeding colony. After that, the agents hiked to the colony once each year to ring new birds and identify the burrows. Then, the Mascarene petrel. The 15th of November 2016 is a day engraved in our memory forever. Personally and for the entire team, it was a memorable event that we all have been waiting since 2001. It’s a real turning point in the conservation of the Mascarene petrel. Could you describe the program in 3 words? Human adventure, efficiency and durability! it has to go on even after the LIFE! Database-management system in the LIFE+ Petrels project! A project of the scale of the LIFE+ Pétrels gathers a large amount of datas such as field observations, scientific monitoring, sounds, pictures and videos recorded. It was important to structure it so that this data could be stored properly, be easily accessible and, most importantly, be usable! 3 years after the beginning of the project, it was vital for the LIFE+ Pétrels to improve its database-management system. Guillaume thus came as backup to help the team as part of an 8 months Voluntary Civilian Service. Here is his experience. Light pollution is the alteration of the natural nocturnal light produced by anthropogenic light. Theses artificial lights are often badly orientated, in too great of a number and clustered in highly urbanised area. This pollution has an important impact on biodiversity. It modifies the biological rhythms of plants, animals and human beings. In Réunion, as in other islands around the world, petrels and shearwaters are particularly affected by this nuisance. News about the Mascarene petrel ! Since the discovery of the first Mascarene petrel breeding colony on the 15th of November, 2016 above Saint-Joseph, things progressed! Feedback on the InterLIFE 2017 ! 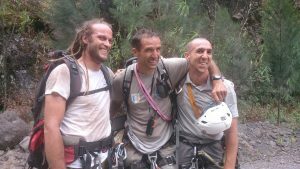 This year, the Réunion National Park and its partners had the pleasure and the privilege to host the French InterLIFE 2017 from the 4th to the 8th of December. This was the first time since the LIFE programme was created in 1992 that an Overseas department hosted such an event. The 25th anniversary of the LIFE programme: LIFE+ Pétrel headquarters were inaugurated! This year, the European Commission celebrates the 25th anniversary of its environmental funding instrument: LIFE. This fund allows the member states to set up ambitious environmental programs in order to promote biodiversity and combat climate change. Since its creation in 1992, more than 4000 projects were initiated by the LIFE program for a sum total of 3,1 billion Euros. Assessment of “La Rentrée des Pétrels” – 3rd edition! While pupils already came back from summer holidays some time ago, our petrels are only coming back now from their journey at sea! This event was organized by the town of Saint-Louis, the Réunion National Park and the LIFE+ Pétrels. It gathered different environmental protection structures around this issue. Artistes and local associations assembled to celebrate the petrels’ return on our island! The 2016-2017 season: Assessment of field actions regarding the monitoring of the Barau Petrel’s colonies. To save a species, one must know it. Each breeding season of the Barau petrel, the LIFE+ Pétrel team and its partners work on understanding this species, whether on the field, in the laboratory or at the office. But what do the field agents do regarding the understanding of the species?